and to provide [future] rest for you, along with us, who are afflicted. 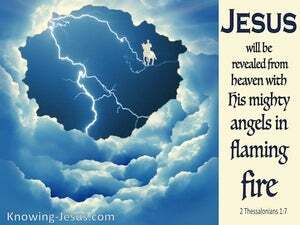 [This will occur] when Jesus is revealed from heaven in blazing fire [i.e., at His second coming], accompanied by His mighty angels. 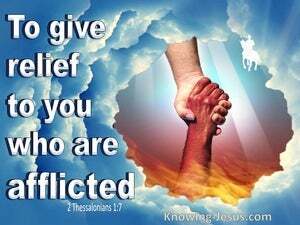 and to you who are being afflicted to give rest together with us when the Lord Jesus is revealed from heaven with his mighty angels. 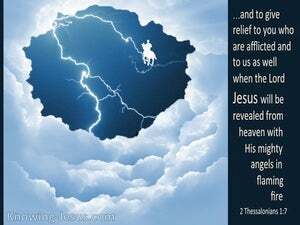 and to requite with rest you who are suffering affliction now--rest with us at the re-appearing of the Lord Jesus from Heaven, attended by His mighty angels. 6 For after all it is only just for God to repay with affliction those who afflict you, 7 and to give relief to you who are afflicted and to us as well when the Lord Jesus will be revealed from heaven with His mighty angels in flaming fire, 8 dealing out retribution to those who do not know God and to those who do not obey the gospel of our Lord Jesus.